To add a new contact, select +Create contact from the top of the list. Enter the name of the contact’s Company. As you begin typing, the company list is narrowed down. You can select Add company to add the company if the contact’s company is not yet in your company database. Use the Active toggle to separate active contacts from inactive contacts. Enter the contact’s business Phone number. Enter the contact’s Mobile phone number. To assign one or more categories to the contact, select them from the Categories drop-down list. 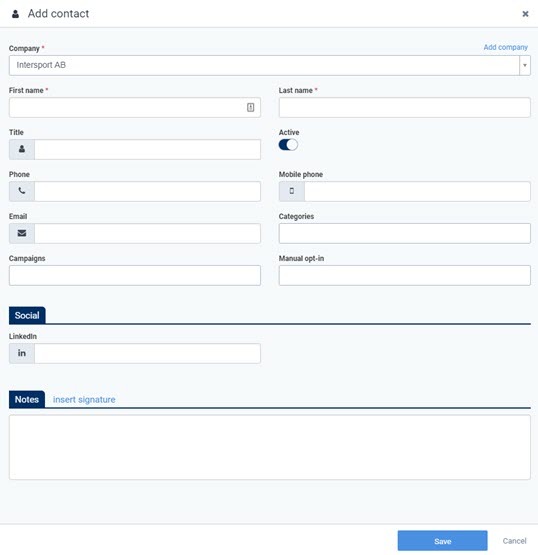 To assign one or more campaigns to the contact, select them from the Campaigns drop-down list. Enter any applicable Social links. Select Insert Signature next to Notes to automatically add your user name and the current date and time to the Notes for this contact. You can include additional text as a note that will show in the Sidebar for the Contact card.